Wanna bet the get lucky goes up in price? Based on the pictures shown here of If You're Lucky, the fabric of the older version looks a bit more sheer in front than the newer version. The logo on the newer version looks more pronounced, in fact I can't even see it on the older version. Also, the newer version will probably cost more!!! Nothing in this sneak peak interests me, looks to be a safe week ahead. I don't find any of these items appealing. The scarf looks like a blanket - pretty pattern but screams I am wearing a blanket. The If You're Lucky LS II looks shorter in the arms and body then the previous version. In the original you can see it's bum-covering length (which is my preference for a to-from type top. Good catch on the logo change on the new If You're Lucky. In the previous releases the logos were white and black so they blended in with the material. I really hate sleeves that end above the wrists and I bet you are right about a price increase. none of this stuff is appealing to me. that poncho looking thing is hideous. The sleeves look awfully short on the new If You're Lucky LS - yikes! Too sort sleeves are the worst - they look terrible and you can't do anything about them, on the other hand sleeves that are too long can be made to look ok.
Oh wow, those sleeves look really short. I really hate the direction lulu is going lately. It seems things are getting shorter, less details, stripes don't match on $100 pants.....all, I'm sure, as cost cutting, profit in pocket measures. Yet prices keep going up. So disappointing. It's sad really. Kind of feels like the end of a bad relationship. Glad to be out but yet you dream of what used to be. Lol! Zero appeal. The scarf at the end had promise only because of the green/teal colour in it but it's cotton and I'm not going to pay some exorbitant LLL price for it. 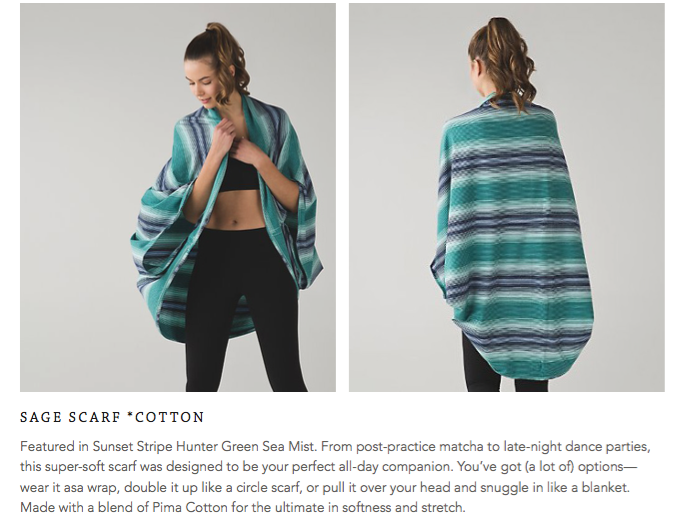 They already cheapened the vinyasa scarves which are generally much more durable. The lucky line was fug! the first time around. Works for me tho. I've spent all my money buying up studio IIs. Forgot to add that I do like the jungle hero blue, it looks alright. But I'd rather pass on a striped pattern, would prefer solid jungle green especially in a CRB. Hero Blue is a great blue - I got the Sit in Stillness Pant in that colour from wmtm. Not much of this appeals to me. What is with the dark colours? We are heading into spring, not fall/winter right? I don't get it. Agree that everything is getting TOO short :(. However, guess that saves me some moola since I know it's not even worth trying with my long torso :p. Also, sick of the price hikes! Should really make it easy to curb my ridiculous lulu spending. LuluAddict, I'm with you on hating sleeves that end above the wrists. I'd rather have sleeves that are a little too long than sleeves that are too short. I'm petite and so far haven't had any complaints about Lulu's sleeve lengths, a lot of my jackets and tops are a little long in the sleeves but I can make it look good and I prefer it to having shorter sleeve length that just looks all wrong. Not loving the zipper placement on the jacket. 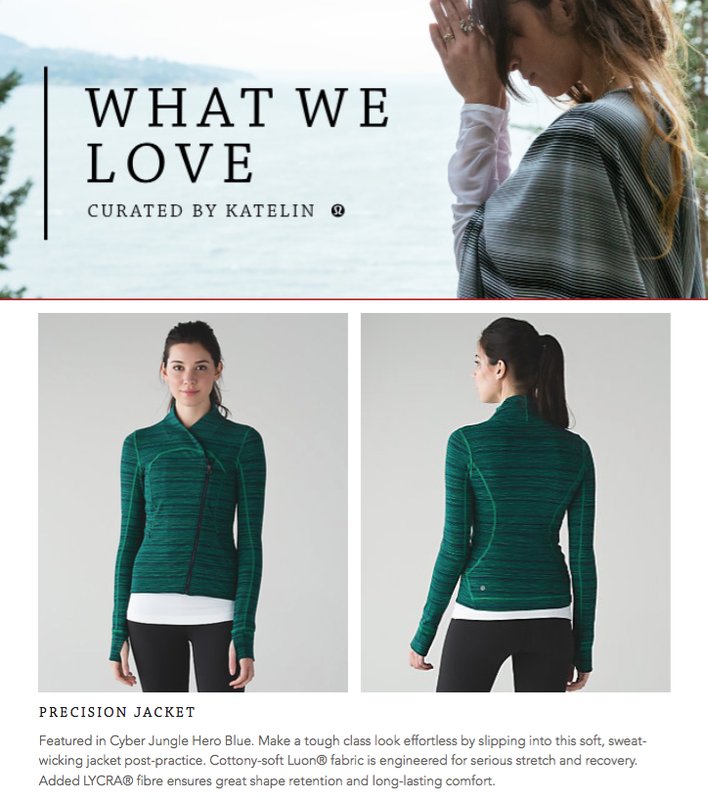 Wish it was placed more like the zipper on the Bhakti Yoga Jacket. Also, I'm guessing this new jacket will be ridiculously priced, my guess is $128. I second the comment that I would love the solid green. Enough with the striped patterns! Jacket is cute but too short. The sage scarves are too weird. Like a snuggle or something. I never cared for the If You're Lucky capsule, so no appeal there. But, I'm not really discouraged because usually I don't see anything I like in WWL. I've still managed to go over budget on Lulu this year, so as much as I complain, they must be doing something right! I didn't post a HK upload this week since it was tiny but a black Precision Jacket was uploaded if anyone wants to see more photos of it. People were saying it's a mishmash of a Forme and Bhakti jacket. I have three space dye twist stripe bottoms in Sapphire, Cosmic Teal, and Peacock plus Naval Cyber Stripe and a Textured Stripe and feel I can't really justify anymore since they're so similar except for the shade. I wish they do more like the textured wave, where the pattern is at least a little different. 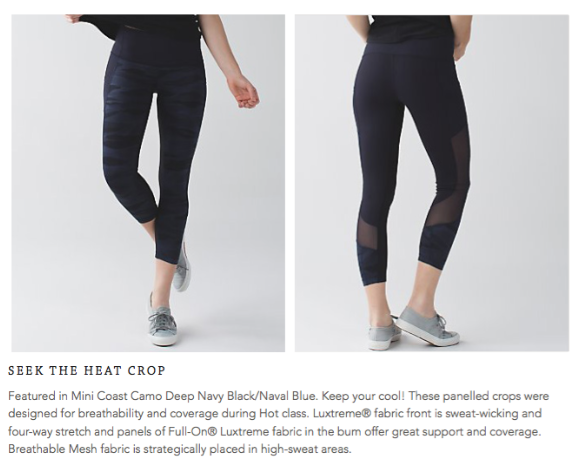 Seek The Heat Crops are described as having mesh fabric in "strategically placed high-sweat areas". I am confused then why they are placed on the back of the calf and down the side of the leg. For anyone out there that does Hot class, would these mesh panels have any technical value to you or would they be only of style value? Omg I have a pair of seek the heat in regal plum or something I absolutely love the waistband and fit of them. Not crazy about mesh but I will Def get ànother colour .! @carmelody - What We Love is a preview of what is coming the following week, so these items will be in Tuesday's upload. I just bought the IYL LS and the sleeves are fine, just long enough. Obviously no thumb holes..